The attacks, which were linked to local members of the Egyptian Islamic Jihad, brought Osama bin Laden, Ayman al-Zawahiri, and their terrorist organization, al-Qaeda, to the attention of the U.S. public for the first time, and resulted in the Federal Bureau of Investigation (FBI) placing bin Laden on its ten most-wanted fugitives list. The FBI also connected the attack to Azerbaijan, as 60 calls were placed via satellite phone by bin Laden to associates in the country's capital Baku. Fazul Abdullah Mohammed and Abdullah Ahmed Abdullah were credited with being the masterminds behind the bombings. The bombings are widely believed to have been revenge for U.S. involvement in the extradition, and alleged torture, of four members of Egyptian Islamic Jihad (EIJ) who had been arrested in Albania for an alleged series of murders in Egypt in the two months prior to the attacks. Between June and July, Ahmad Isma'il 'Uthman Saleh, Ahmad Ibrahim al-Sayyid al-Naggar, Shawqi Salama Mustafa Atiya and Mohamed Hassan Tita were all renditioned from Albania to Egypt, with the co-operation of the United States; the four men were accused of participating in the assassination of Rifaat el-Mahgoub, as well as a later plot against the Khan el-Khalili market in Cairo. The following month, a communique was issued warning the United States that a "response" was being prepared to "repay" them for their interference. However, the 9/11 Commission Report claims that preparations began shortly after bin Laden issued his February 1998 fatwa. According to journalist Lawrence Wright, the Nairobi operation was named after the Holy Kaaba in Mecca; the Dar es Salaam bombing was called Operation al-Aqsa in Jerusalem, but "neither had an obvious connection to the American embassies in Africa. Bin Laden initially said that the sites had been targeted because of the 'invasion' of Somalia; then he described an American plan to partition Sudan, which he said was hatched in the embassy in Nairobi. He also told his followers that the genocide in Rwanda had been planned inside the two American embassies." Wright concludes that bin Laden's actual goal was "to lure the United States into Afghanistan, which had long been called 'The Graveyard of Empires.'" In May 1998, a villa in Nairobi was purchased by one of the bombers to enable a bomb to be built in the garage. Sheikh Ahmed Salim Swedan purchased a beige Toyota Dyna truck in Nairobi and a 1987 Nissan Atlas refrigeration truck in Dar es Salaam. Six metal bars were used to form a "cage" on the back of the Atlas to accommodate the bomb. In June 1998, KK Mohamed rented House 213 in the Illala district of Dar es Salaam, about four miles (6 km) from the U.S. embassy. A white Suzuki Samurai was used to haul bomb components hidden in rice sacks, to House 213. In both Nairobi and Dar es Salaam, Mohammed Odeh supervised construction of two very large, 2,000-pound (900 kg) destructive devices. The Nairobi bomb was made of 400 to 500 cylinders of TNT (about the size of drink cans), ammonium nitrate, aluminium powder and detonating cord. The explosives were packed into twenty specially designed wooden crates that were sealed and then placed in the bed of the trucks. Mushin Musa Matwalli Atwah ran a wire from the bomb to a set of batteries in the back of the truck cab and then to a detonator switch beneath the dashboard. The Dar es Salaam bomb was of slightly different construction: the TNT was attached to fifteen oxygen tanks and gas canisters, and was surrounded with four bags of ammonium nitrate fertilizer and some sand bags to tamp and direct the blast. The bombings were scheduled for August 7, the eighth anniversary of the arrival of U.S. troops in Saudi Arabia during the early stages of the Persian Gulf War, likely a choice by Osama bin Laden. On August 7 between 10:30 a.m. and 10:40 a.m. local time (3:30–3:40 a.m. EDT), suicide bombers in trucks laden with explosives parked outside the embassies in Dar es Salaam and Nairobi, and almost simultaneously detonated. 213 people were killed in the Nairobi blast, while 11 were killed in Dar es Salaam. An estimated 4,000 in Nairobi were wounded, and another 85 in Dar es Salaam. Seismological readings analyzed after the bombs indicated energy of between 3 to 17 short tons (2.7 to 15.4 metric tons) of high explosive material. Although the attacks were directed at U.S. facilities, the vast majority of casualties were local citizens of the two African countries. 12 Americans were killed, including two Central Intelligence Agency employees in the Nairobi embassy, Tom Shah and Molly Huckaby Hardy, and one U.S. Marine, Sergeant Jesse Aliganga, a Marine Security Guard at the Nairobi embassy. U.S. Army Sergeant Kenneth R. Hobson II was one of the 12 Americans killed in the attack. While Azzam drove the Toyota Dyna quickly toward the Nairobi embassy along with Mohamed Rashed Daoud Al-Owhali, local security guard Benson Okuku Bwaku was warned to open the gate immediately – and fired upon when he refused to comply. Al-Owhali threw a stun grenade at embassy guards before exiting the vehicle and running off. Osama bin Laden later offered the explanation that it had been Al-Owhali's intention to leap out and shoot the guards to clear a path for the truck, but that he had left his pistol in the truck and subsequently ran off. As Bwaku radioed to Marine Post One for backup, the truck detonated. The explosion damaged the embassy building and collapsed the neighboring Ufundi Building where most victims were killed, mainly students and staff of a secretarial college housed here. The heat from the blast was channelled between the buildings towards Haile Selassie Avenue where a packed commuter bus was burned. Windows were shattered in a radius of nearly 1⁄2 mile (800 m). A large number of eye injuries occurred because people in buildings nearby who had heard the first explosion of the hand grenade and the shooting went to their office windows to have a look when the main blast occurred and shattered the windows. Meanwhile, the Atlas truck that attacked the US Embassy at 36 Laibon Road, Dar es Salaam was being driven by Hamden Khalif Allah Awad, known as "Ahmed the German" due to his blond hair, a former camp trainer who had arrived in the country only a few days earlier. The death toll was less than in Nairobi as the U.S. embassy was located outside the city center in the upscale Oysterbay neighborhood, and a water truck prevented the suicide bombers from getting closer to the structure. Following the attacks, a group calling itself the "Liberation Army for Holy Sites" took credit for the bombings. U.S. investigators believe the term was a cover used by Egyptian Islamic Jihad, who had actually perpetrated the bombing. In response to the bombings, President Bill Clinton ordered Operation Infinite Reach, a series of cruise missile strikes on targets in Sudan and Afghanistan on August 20, 1998, announcing the planned strike in a prime time address on U.S. television. The United Nations Security Council passed Resolution 1189 condemning the attacks on the embassies. 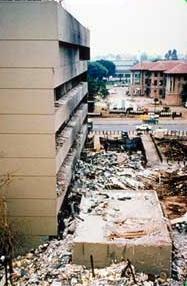 Both embassies were heavily damaged and the Nairobi embassy had to be rebuilt. It is now located across the road from the United Nations Office at Nairobi for security purposes. A memorial park was constructed on the former embassy site, dedicated on the third anniversary of the attack. Public protest marred the opening ceremony after it was announced that the park, including its wall inscribed with the names of the dead, would not be free to the public. As of 2018[update], the park continues to charge an entrance fee. Within months following the bombings, the United States Department of State Bureau of Diplomatic Security added Kenya to its Antiterrorism Assistance Program (ATA), which was originally created in 1983. While the addition was largely a formality to reaffirm U.S. commitment to fighting terrorism in Kenya, it nonetheless sparked the beginning of an active bilateral antiterrorism campaign between the United States and Kenya. The U.S. government also rapidly and permanently increased the monetary aid to Kenya. Immediate changes included a $42 million grant targeted specifically towards Kenyan victims. In 2001, lead plaintiff James Owens, and others, filed a civil lawsuit against Sudan, for its role in the attack. They argued that Sudan was at fault for providing sanctuary to the bombers, prior to the attack. They were awarded over $10 billion. Sudan, which had not appeared during the initial lawsuit, appealed the judgment, arguing it did not understand the US civil suit system, and did not understand the consequences of not appearing. The appeals court discounted that argument, but removed $6 billion of punitive damages that relied on violations of laws passed after the attack. Following the investigation, an indictment was issued. It charges the following 21 people for various alleged roles in the bombings. 18 of the cases have been settled. Mustafa Mohamed Fadhil Killed in Afghanistan. ^ "Book Review: 'Mercenaries, Extremists, and Islamist Fighters in Karabagh War". Armenian Weekly. Archived from the original on August 5, 2013. Retrieved January 21, 2013. ^ Bennett, Brian (June 12, 2011). "Al Qaeda operative key to 1998 U.S. embassy bombings killed in Somalia". Los Angeles Times. Archived from the original on June 13, 2011. ^ "Al-Qaida timeline: Plots and attacks – World news – Hunt for Al-Qaeda | NBC News". MSNBC. Archived from the original on November 7, 2012. Retrieved January 21, 2013. ^ "Читать онлайн "The Black Banners" автора Soufan Ali H. - RuLit - Страница 83". Archived from the original on January 15, 2014. ^ Mayer, Jane (2008). The Dark Side: The Inside Story of How The War on Terror Turned into a War on American Ideals. New York: Doubleday. p. 114. ISBN 978-0-385-52639-5. ^ Advocate, Victoria (August 13, 1998). "Bombings connect to mysterious arrests". ^ Higgins, Andrew (November 20, 2001). "A CIA-Backed Team Used Brutal Means to Crack Terror Cell". Wall Street Journal. Archived from the original on October 23, 2017. ^ Wright, Lawrence (2006). Looming Tower: Al Qaeda and the Road to 9/11. New York: Knopf. p. 272. ISBN 0-375-41486-X. ^ a b c Benjamin, Daniel; Simon, Steven (2002). The Age of Sacred Terror. New York: Random House. ISBN 0-375-50859-7. ^ Hamm, Mark (2007). Terrorism As Crime: From Oklahoma City to Al-Qaeda and Beyond. NYU Press. p. 65. ISBN 9780814737453. Retrieved June 23, 2016. ^ Hamm, Mark S. (2007). Terrorism as Crime: From Oklahoma City to Al-Qaeda and Beyond. NYU Press. p. 66. ISBN 978-0-8147-3696-8. Retrieved September 13, 2011. ^ Gunaratna, Rohan (2002). Inside Al Qaeda. New York: Columbia University Press. p. 46. ISBN 0-231-12692-1. ^ "U.S. Embassy Bombings". U.S. Department of State website. Archived from the original on August 5, 2007. Retrieved August 4, 2007. ^ "Frontline: The trail of evidence - FBI executive summary". PBS.org. Archived from the original on January 21, 2015. Retrieved May 2, 2014. ^ "Some Practical Applications of Forensic Seismology" (PDF). Archived (PDF) from the original on October 29, 2013. Retrieved November 3, 2010. ^ "Profiles of Americans killed in Kenya embassy bombing". CNN.com. August 13, 1998. Archived from the original on December 16, 2006. Retrieved November 18, 2008. ^ Associated Press, "Bin Laden raid avenged secret CIA deaths", Japan Times, May 30, 2011, p. 1. ^ "Fil-Am hero guard killed in Nairobi". highbeam.com. Archived from the original on November 2, 2012. Retrieved December 24, 2011. ^ a b Ressa, Maria (2003). Seeds of Terror. New York: Free Press. ISBN 0-7432-5133-4. ^ a b Katz, Samuel M. (2002). Relentless Pursuit: The DSS and the manhunt for the al-Qaeda terrorists. New York: Forge/Tom Doherty. ISBN 0-7653-0402-3. ^ Global Briefings, Issue 27, "Osama bin Laden tied to other Fundamentalists", September 1998. ^ "Security Council strongly condemns terrorist bomb attacks in Nairobi and Dar es Salaam on August 7". United Nations. August 13, 1998. Archived from the original on September 20, 2014. ^ a b "Fee for Kenya memorial raises ire". The Arizona Republic. Phoenix, Arizona. Washington Post. 8 August 2001. p. 13. Archived from the original on November 5, 2018. Retrieved 22 October 2018 – via Newspapers.com. ^ "American Embassy Memorial Garden". Lonely Planet. Archived from the original on October 23, 2018. Retrieved October 22, 2018. ^ "United States Aid to Kenya: Regional Security and Counterterrorism". Archived from the original on March 9, 2011. Retrieved June 1, 2011. ^ Nick Divito (March 25, 2016). "Sudan On the Hook for Terrorism Judgments". Courthouse News. Washington DC. Archived from the original on July 31, 2017. Retrieved July 29, 2017. Between March and October 2014, the D.C. District Court entered judgments of more than $10 billion on behalf of relatives and victims who had filed seven complaints after the attacks. ^ Adam Klasfeld (July 28, 2017). "D.C. Circuit Lightens Sudan's Load on Terrorism Judgments". Courthouse News. Washington DC. Archived from the original on July 29, 2017. Retrieved July 29, 2017. On appeal, Sudan advanced several arguments for its district court no-show. The county had to grapple with natural disasters and civil wars, and argued it did not understand the U.S. legal process enough to appreciate the consequences of its absence. ^ Patrick Boyle (March 24, 2016). "D.C. Judge Upholds $10B Against Sudan In Embassy Bombings". Law 360. Washington DC. Archived from the original on July 31, 2017. Retrieved July 29, 2017. A D.C. federal judge Wednesday upheld $10 billion in damages to victims of the 1998 U.S. embassy terrorist bombings who had accused Sudan of supporting the attacks, declaring the country had no grounds to overturn the award after failing to respond to the lawsuits for four years. ^ "United States v. Osama bin Laden, et al" (PDF). (indictment). Provided by the Monterey Institute of International Studies. Archived from the original (PDf) on September 6, 2012. ^ "Inmate Locator search for register number '42426-054'". Federal Bureau of Prisons. Archived from the original on May 17, 2015. Retrieved December 8, 2012. ^ "Ex-Bin Laden aide sentenced to life in embassy bombings". BBC News. Archived from the original on January 31, 2016. Retrieved January 25, 2016. ^ "Inmate Locator search for register number '42393-054'". Federal Bureau of Prisons. Archived from the original on March 10, 2012. Retrieved December 8, 2012. ^ "Egyptian Gets 25-Year Term in 1998 Embassy Bombings; Judge Calls Plea Deal Generous". NYTimes.com. Archived from the original on February 10, 2015. Retrieved February 14, 2015. ^ Miller, Greg (February 21, 2010). "Increased U.S. drone strikes in Pakistan killing few high-value militants". The Washington Post. Archived from the original on September 28, 2012. Retrieved December 8, 2012. ^ "Inmate Locator search for register number '42375-054'". Federal Bureau of Prisons. Archived from the original on September 19, 2012. Retrieved December 8, 2012. ^ "Inmate Locator search for register number '42371-054'". Federal Bureau of Prisons. Archived from the original on September 19, 2012. Retrieved December 8, 2012. ^ "INTELWIRE.com -- Open-source intelligence, primary source documents, analysis by J.M. Berger, co-author of ISIS: The State of Terror, author of Jihad Joe: Americans Who Got to War in the Name of Islam" (PDF). Archived (PDF) from the original on July 16, 2014. ^ "JTF-GTMO Detainee Assessment for Majid Abdu Ahmed" (PDF). ^ "Inmate Locator search for register number '44623-054'". Federal Bureau of Prisons. Archived from the original on September 19, 2012. Retrieved December 8, 2012. ^ "Inmate Locator search for register number '02476-748'". Federal Bureau of Prisons. Archived from the original on September 20, 2012. Retrieved December 8, 2012.